1- Always provide a fresh bowl of water where your cat likes to walk or sit. This will encourage drinking more water, especially if you use a wide bowl or large container as it keeps the water cold; and they like it as in nature they drink from small water springs, rivers and lakes. 2- If your cat is old, or it is that type of cats which forget the places easily or get confused when you change the bowls, place a fresh bowl in each room like a reminder for the cat to drink. 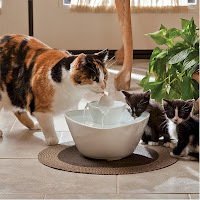 3- Change the water bowl once everyday in closed houses/apartments, and twice in case of many cats or in case of opened places where dust and tree leaves can fill the bowls. 4- In hot climates, make sure to add cold water “not too cold” to the water bowl. The mixed water is usually more appealing to cats, in addition to refreshment each time they drink. 5- If you live in closed place, like an apartment, place the cat’s water bowl near flower and plant pots, or where there is an air conditioner “directly where the air hits”, and you will see an amazing appetite for drinking. Also use cat drinking fountains and it will get your curious cat to drink each time it tries to discover that small waterfall beside your plant pots. 6- If you provide your cat dry foods, try to reduce the number of daily meals and provide a bowl of fresh milk, yogurt or your cat’s favorite soup. If your cat doesn’t like drinking soup, you may add fish or poultry to the vegetable soup. 7- Some cats may not like drinking soups, so the best option is to prepare fish soup that contains a variety of seafood/fish; then mix it in the blender. That soft fish smoothie will appeal much to your cat, and you can preserve it in the freezer and use when needed. 8- If your cat doesn’t like all the above options and you see that it is not drinking an appropriate amount of water, your final option will be hydrating the dry food with water or milk, or use a small syringe to give it water from time to time. 9- Away from cats’ food, everyone who keeps an animal at their apartment, house or farm should allow a place that is full protected from sunlight, heat and wind for their animals. So, wherever you live make a special, comfortable place for your pet and provide the season essentials like cooling/heating, suitable sleeping sheets, water…etc. 10- An important tip for those who live in opened places is to NOT leave your pets outside for long in summer/winter. Make sure the pet door is always opened, providing them easy access to the house anytime. From time to time seek the pets as other family members could forget them outside while they can’t get in or hide from the sun, drink, sleep…etc. 11- Always communicate with your pets in a way that shows you what they love, when they need care and what they need. The pet’s needs, when easily understood, can save their lives in severe or emergency cases, and after all remember that they are living beings like us and if you decide to keep a pet, then you should be responsible enough.